50 Names in front of cornerstone of First UMC, Portland, Oregon. We were halfway through the list. The names had been recited for a while now, each followed by a gong of a bell in remembrance. But as I felt the weight of each name being read, I was starting to wonder if I had made a terrible mistake. 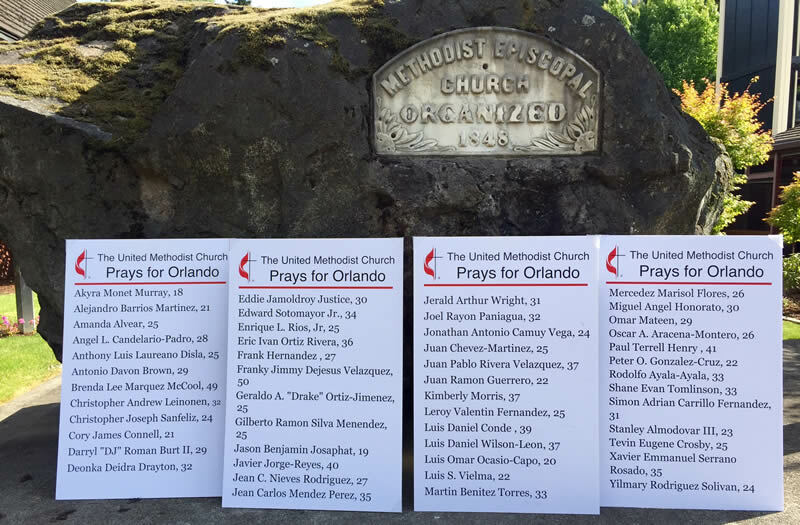 Two days prior, I had been tasked with making signs for a vigil held at the annual meeting of all the United Methodists in Oregon and Idaho. It required a quick turn-around but I had the technical expertise to make it happen. The vigil would name those who had died in Orlando. These names who were being read now, in pairs and switching voices between the pairs, with a bell gonged after each name. As context, the United Methodists and regional Salem, Oregon, folks gathered at 8pm on a Friday night. They gathered to read names, statements by our church officials, and a somber walk of remembrance around the downtown area with candles and signs. It was a powerful group and time together. None of us knew the victims. None of them were United Methodist, near as we know. But we prayed and remembered them as best we could. As each name was read, right about in the middle of the Luis’s, I started second-guessing the signs that I had made. There were 49 victims shot and killed in Orlando. I said I would be putting the names of those killed in Orlando on the signs. So the signs had the 49 names, taken from Washington Post, alphabetical by first (given) name. But I had 50 names on the lists. I started re-thinking them as we came to just a few away from his name. Was it insensitive to include the shooter’s name along with those he killed? Was it too much to spend even a breath on the man who took others’ breath away for good? As usual, the convictions started rising up in my head. Convictions that to some it may be unconscionable to include the shooter’s name along with his victims, but I believed it would be un-Christian to not include him. “Pray for your enemies” and such. In fact, I made sure I was the one holding the sign with the shooter’s name on it so I could respond to any challenges. But in that moment, reading those names, the truth of the matter finally penetrated my heart. Had I, as a straight white man, chosen the wrong action? Had my privilege driven me to arrogance that I could make a decision to include a person’s name among the LGBTQ and ethnic minority persons that the shooter had killed? Oh God. What had I done? It was too late. We were there. It was time. Oh no. They skipped it. They skipped the shooter’s name. I was sure I had done it. I had gone too far in my definition of Christian charity. And the leaders had decided–rightly, I’m sure–that it was inappropriate. That the two people reading–both of which represented people groups killed in Orlando–decided it was too painful to read. The names kept coming, with most ages younger than mine, and names of cultures that were not mine. And my fears ebbed away: it was done. I could only now immerse myself in the names, ashamed that for almost 10 of them I had focused on myself, instead of the time of remembrance at hand. I could only imagine their faces and lives, and what it was like growing up queer in a culture and ethnicity that rejects them. The courage to be themselves within the safe confines of a nightclub that was a sanctuary for them. The horror of those final moments alongside friends, partners, and strangers huddled together, hoping the door to the bathroom would not open. The last name. That was it. The silence that followed was longer than the others. It had a sense of finality. I saw the next speaker rise to go to the microphone. But then I heard a voice full of the same conviction as the other 49 names speak. There was movement in the gathered group. Compressed lips with a nod, or furrowed brows and head shakes. We continued with prayers, statements, and the walk. I carried the sign, and not one person challenged it. Before you advocate for a people group that is not your own, include others from that people group in your discernment. Give them veto power over your action, as they have an experience that is different than yours, and in this situation, it has more authority. When you are in the moment, instead of thinking about yourself and where you are standing or saying, just listen to and participate in the experience. You can think about yourself later. Remember that the ends do not justify the means. Even though my action turned out to be (probably) the right one, the way I went about it was wrong. And if you are a straight white male like me, it’s probably best to live these out at all times to help the world better reflect the diversity of humanity instead of just the dominant segment. Yes, Orlando is the perfect example of radical forgiveness ! And how sad that that young man was so deceived and confused. Can he possibly see the kingdom of God now! Are we close to the end times? Every generation has thought that they were. But today the Word surely can go out to the ends of the world with the modern communication we now have, and with Bible translators working overtime ! These days are full of evil and we must remember to pray , always , everyday to gird oneself with the safety of our Lord, Jesus Christ!! Remember to forgive all, all things! As God forgives us, radically forgives us!